Need to get the kids to school, but still want to use your regular bike? Why not try a trailer? 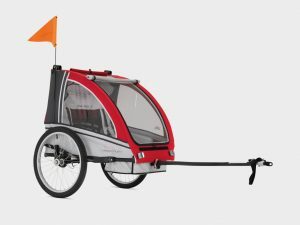 Trailers offer the advantages of cargo bikes with the ability to carry two children or additional cargo, but with the convenience of using your own bike and being able to detach the trailer when not in use or once you’ve dropped the kids at nursey or school. Trailers usually fold flat for easy storage and often convert to buggies once you’re at your destination making them a really versitile solution. We keep a stock of the Adventure AT6 Trailer in our showroom, which we feel offers an excellent balance of quality, features and value, but also sell Croozer and Thule trailers. We also have a small fleet of Kiddyvan Trailers available to hire so you can try trailers for longer testing.